Resource planning is a process of allocating tasks to human and non-human resources in a way that would maximize the efficiency of the resources. 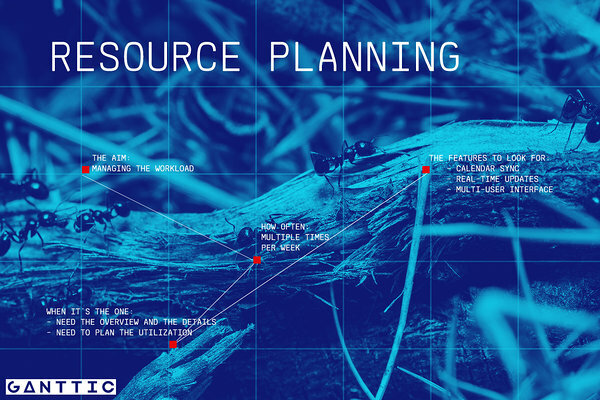 Resource planning can also be a process of allocating tasks to human and non-human resources in order to get an overview of resource availability and capacity. It can be both of those things and it can be something in between. Some organizations need to get a general overview and others manage the everyday work. Some organizations only need to know if there are enough resources to take on a new project. Some need to plan the work with 15-minute accuracy with all the details they can get. Some need to find a balance in between. There are no rights and wrongs. There’s only what suits you. 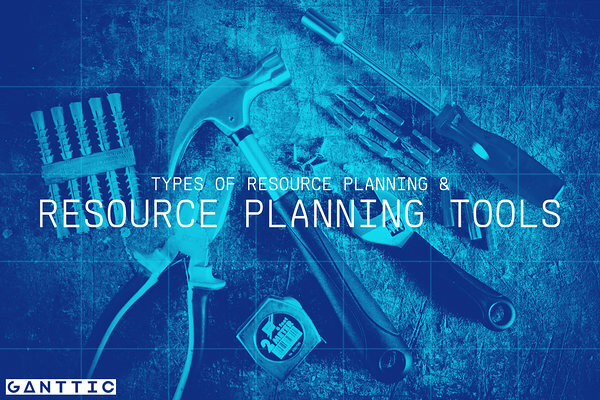 Resource planning tools are the tools that allow you to do the kind of planning that suits you (or at least that’s the case if you have chosen a good one, hehe). 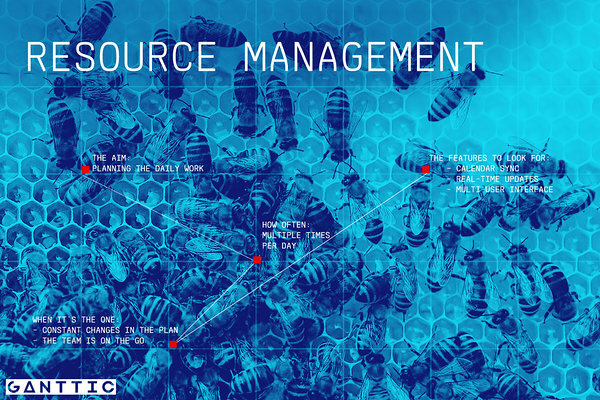 At the core, there are three types of resource management. There’s scheduling, there’s planning, and there’s management. In this article, we are going to explain the difference and give you some pointers with each level. Simple scheduling is for those that need the overview for forecasting resource availability and nothing else. It can be a tool to provide a link between the budget and the plan. Our users have described it as dragging and dropping tasks to available resources with the right skills. They use all-day tasks and they don't adjust the utilization. 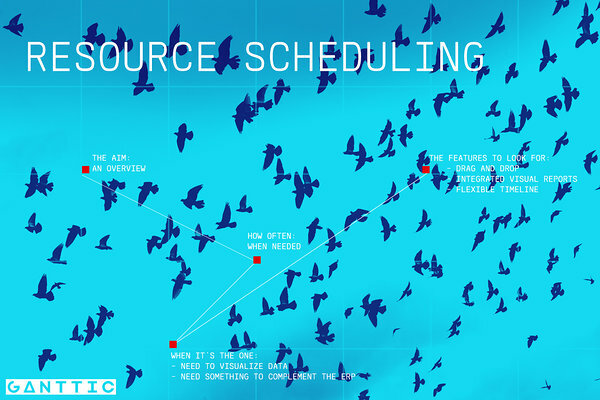 For them, scheduling is a way to visualize their data. Visualization using Gantt charts makes data easy to read and absorb. Scheduling isn’t necessarily done for better communication inside the project team or for collaboration which might sound like an illegal thing to say in today’s project management world. However, resource scheduling is done to give those that plan the work a better understanding of what’s going on. If done right, it will improve team communication and collaboration. Simple scheduling should be done as often as needed. That’s the rule with any kind of resource planning. Plans only make sense if they are up to date. If there are changes, the changes should be apparent in the plans. If a new project accepted, the resource schedule should be updated. Otherwise, the resource schedule has no point. That being said, resource scheduling is most often done once a week or even less than that. Resource scheduling is for those that need to visualize the data using Gantt charts. It’s usually not the only resource planning that’s done in the organization. Resource planning software like Ganttic is more commonly an approachable scheduling addition to a complicated ERP system. Good tools for resource scheduling are those that include features like drag and drop, integrated visual reports or graphs, a flexible timeline (for short-term and long-term availability tracking) and the capability to process large amounts of data. More detailed resource planning is for those that want to optimize the work that’s being done. What makes it more detailed is usually the capacity planning. Resource planning brings together the planning for budget and the planning of day-to-day tasks. A great example that examines resource planning is a case study that we conducted with Innopolis Engineering. Their default view is 9 months and they plan one week at a time. Meaning they plan day-to-day tasks while having one eye on the big picture. Ganttic is mostly used by their department managers. Resource planning should be done several times per week. The rule that all changes should be apparent in the plans as they happen and not ad hoc still holds. Resource planning means constant resource allocation and task prioritization. The people that the plans are made for should be able to see the plans whenever they want and sync them with their calendar. To do resource planning well, you need to have regular resource planning meetings with the concerned parties. The project managers and the sales team should be present. That way it’s clear how many resources are needed and where there is room for a new project. Therefore, resource planning is for team leaders that need to plan the daily tasks of their team. Since it has a lot to do with capacity planning, the necessary features are resource utilization calculations, task utilization, conditional task coloring, and integrated reports. Full-on resource management is daily task planning. It’s the type of resource planning that calls for live updates, a mobile app AND calendar sync. It’s taking resource planning to the next level. Resource management is the most detailed out of the three and you need a lot of details if you want to do detailed resource management. Managers that are using Ganttic for resource management say that custom data fields are their best friends. Custom data fields allow you to add any kind of data to your project plan. As a bonus, you can use the data for filtering, coloring, sorting, etc. Resource management is about having the resource management software at your sight at all times. Whether it’s for planning and reallocating or if it’s for checking what’s your next task. Resource management is for those that plan tasks that change often. It's for those that need more than high-level planning. It’s for field workers that are constantly on the go and need to know what’s next on the to-do list through a mobile app. The features that you are going to need for resource management are Google or Outlook Calendar sync, real-time updates, a multi-user interface (with custom user rights), and custom data readiness. As you already know, we at Ganttic are big fans of planning resources using different views. And all of the resource planning levels can be complemented with some views that make getting a grasp on the data easier. If you are looking for a resource planning tool, try Ganttic for free.